NZer1 wrote: ‎"It is suggested that where spinal MS has been diagnosed from clinical observations, patients should be referred for angiological investigation to search for dural arteriovenous fistulas (DAVFs) within the head to identify any treatable subjects." I like the thought processing here, the difference for me is that the breach of BBB may be allowing CPn or Lyme or another antagonist across the BBB, that needs to be defined! if PTA is lasting about six to twelve months isn't that time frame the same as Vasculitis infection time frame quoted for bacterial and viral infections to establish (and probably exacerbate, the quoted time for CPn is about two yearly flair ups depending on conditions) , interlinked? I am far from convinced that these lesions are infectious. I think they are congenital. I think that most of what is called restenosis is probably inadequate dilatation. So would that mean that if a person had a dx of Lyme or CPn there would be no risk of re-stenosis related to their dx? How can this be conformed to remove it from the list of possible causes of vein issues, more and more people are finding a dx of Lyme by the day at the moment. There seems to be a new angle on infectious causes leading to MS because of vein damage. It would be my recommendation that your GP discuss this plan with an infectious disease doctor. I have absolutely no experience treating this infectious process and do not feel it is medically appropriate for me to over see this. We did discuss this at your visit and while I agreed to check the labs I was quite clear that this is not something I feel comfortable treating. The best specialist to consult would be infectious disease. This is from my appointed Neuro, I asked for CPn to be added to the list of bloods when she checked for MS mimics two months ago. I now have two blood results, one in NZ and one in Australia with a positive CPn infection result, plus the scan I sent to you Dr S which I was told there are mild flow disturbances. Does Neurology show an interest in dx'ing their patients? Who will help find answers? I continue blood thinners after stenting for a minimum of six months. I've got a stent and should use Ascal for life....are you suggesting this is not neccessary?? ascal is not a blood thinner. It is an antiplatelet drug that inhibits the aggregation of platelets. This is very different from a blood thinner, a term i would use for an anticoagulant, such as coumadin or pradaxa. why are you using ascal rather than aspirin? i am not saying it is not possible. I am saying i am not convinced. It takes a lot to convince me. I studied every day for more than six months before i treated my first PwMS for CCSVI. A year later I was still skeptical about it. I remain skeptical after treating hundreds of patients. It is my nature. I thought the evidence for CCSVI in 2010 was sparse but at least there was some evidence. I await better evidence. There may well be some PwMS who have had valvulitis. And there are likely many PwMS who have been infected with pathogens who still have a congenital origin of their venous troubles. 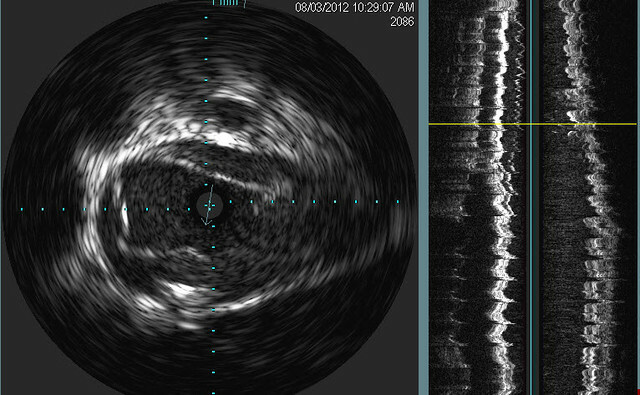 But the appearances on venography and IVUS that I see do not seem to fit that diagnosis. So i am unconvinced but curiously observing at this point. Either way, i treat the venous obstructions whether they are congenital or infectious in origin. Do you have any opinion on these clinics in India using liberation and stem cells with amazing success?? drsclafani wrote: I am far from convinced that these lesions are infectious. I think they are congenital. I think that most of what is called restenosis is probably inadequate dilatation. I do not see sufficient evidence of venous malformations in children with MS to say that they are congenital. The results may indicate that venous malformations are congenital. However, venous malformations may be the result of the interaction between genetics and environmental factors during the life of the person who develops CCSVI syndrome. Unknown factors may also be involved in the formation of venous malformations. I wish Prof Simka and other CCSVI researchers would keep open minds on venous malformations and just treat what they find using the most effective diagnostic tools and treatment methods. Otherwise, they risk falling into a black hole, just like the one that Neuros fell into called autoimmunity." My personal view (after 10 years of studying MS) is that it is a multifactorial disease with CCSVI syndrome being a treatable symptom. 146 years after Charcot's post mortems the etiology of MS is still a mystery. I suggest that CCSVI researchers keep away from drawing conclusions on the etiology of MS. It is a black hole, best avoided, which leaves you open to attack by Neuros. It is a year since you de-stenosed some of my veins for which I am very grateful. However I still think that helping pwMS is a matter of treating symptoms, not altering the etiology of MS. For me, this includes treating CCSVI syndrome, altering the immune system, increasing vit D3 levels, treating CPn and Lyme infections, improving Omega balance, improving diet, changing gut fauna and flora, etc. From a treatment viewpoint different therapies help different pwMS. I do not understand why this is true, but stick with my pharmaceutical approach "if the medicine works use it". Far more learned people that me will determine the etiology of MS in the coming decades (maybe) but 146 years after Charcot I do not suggest any pwMS waits for the whole answer on MS before treating symptoms. b - interaction between genetics and environmental factors during the life of pwMS. c - caused by unknown factors. It is not a trick question as my answer is "I don't know but tend towards 'b' as MS develops later in life than in our early years". Whether antibiotic therapies for these infections improve symptoms remains to be seen but lets hope for that. Certainly many of the other meds patients take are not working. As far as CCSVI goes, whether it is caused by autoimmunity, congenital abnormalities, infectious agents, trauma, tumors and other diseases that cause occlusion or fibrosis, the goal is improvement in arterial and venous blood flow, CSF drainage for the purpose of improving symptoms. Whether treating CCSVI treats MS or delays progression, will take another ten years. elliberato wrote: Do you have any opinion on these clinics in India using liberation and stem cells with amazing success?? can you provide me with a reference in a peer reviewed journal? As I have said from the outset three years ago, I am a humble plumber. That means i treat flow disturbance and obstruction. All this controversy is not interesting to me. I try to improve HOW i treat these lesions, not WHY the form. Both are interesting questions, but what is important to m e right now is how to relieve suffering. i am saying that what I see in patients with MS in the central veins in the neck, does not, in general, look like an infection. For the most part, it still looks to me like a malformation. That is not to say that infectious agents cannot cause demyelinization or even that infectious agents cannot cause vein disease. We know that is true. What we need to find out is whether these infections cause demyelinization or are simply common infectious agents that are found in PwMS because they are being tested. Once that is proven, many patients with a diagnonsis of MS will move out of that category into a specific disease. I am not going to hold my breath. Trials in Canada are more than two years old, and no results yet. I am glad your cognition is holding firm. I think that restenosis is not as common as once thought. I believe it is more commonly underdilatation. I have promised that I would show a case that illustrates my impression that the vein disease in Lymes is dissimilar to that of MS. I want to emphasize at the outset that this is merely an impression because I haven't had many cases of Lymes to view but many with MS. 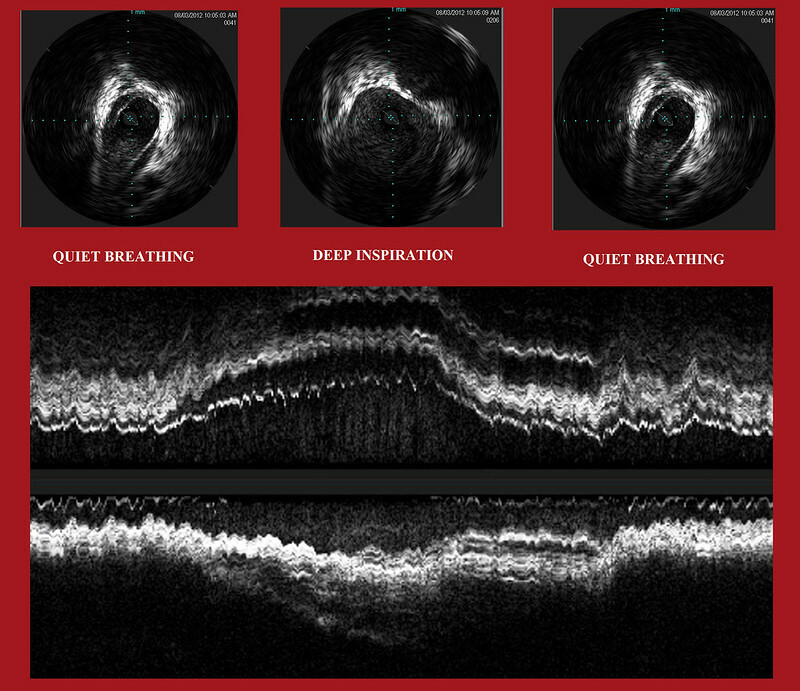 I think that the clue to the differences is in the appearance of the IVUS. We know that in MS there is a greater deposition of Type III collagen and this collagen is less elastic. The valves are taut, immobile and slightly thickened. The thickening is not universally applied across the valve and the wall is not very thick or echogenic. This patient with Lymes is a teenager with long standing LYmes presenting with chronic, intractable incapacitating headaches. The family was desperate and her doctor sought treatment of venous obstructions with the hope that it might improve delivery of antibiotic to the brain. It was a unproven idea but it was done in an heroic effort to help her. Here are some images of LYMES. the wall looks much thicker with areas of high echogenicity and areas of low echogenicity suggestive of edema. the valve has a wavy appearance, is much thicker and much more visible that that of MS.
See how the vein distends in the center image. I have never seen such distension in MS. On cine, it was very remarkable and distinctly different from that of MS. Also, note the thickening inside the vein extending beyond the highly echogenic material....This looks like edema or intimal hyperplasia to me. Never seen anything like this in MS. 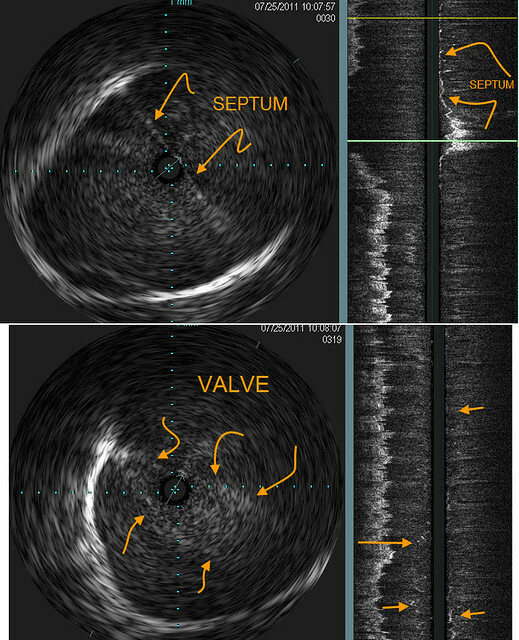 Here is an typical IVUS of a patient with MS.
See how the edges of the valve are slightly visible and the edges are smooth. The valve is not opening but it is fairly straight in its edges. Look also at the longitudinal views. See how the wall is slightly thickened, but not overly echogenic. The optimum way to show this difference is by showing video because it will show how the valve sits in the lumen of the vein and hardly moves at all. Phases of respiration do not make much difference. Distension of the vein during phases of respiration is pretty minor. Unfortunately I cannot show that here. "It is a year since you de-stenosed some of my veins for which I am very grateful. However I still think that helping pwMS is a matter of treating symptoms, not altering the etiology of MS. For me, this includes treating CCSVI syndrome, altering the immune system, increasing vit D3 levels, treating CPn and Lyme infections, improving Omega balance, improving diet, changing gut fauna and flora, etc. From a treatment viewpoint different therapies help different pwMS. I do not understand why this is true, but stick with my pharmaceutical approach "if the medicine works use it". Far more learned people that me will determine the etiology of MS in the coming decades (maybe) but 146 years after Charcot I do not suggest any pwMS waits for the whole answer on MS before treating symptoms." If I had known about the CCSVI blood reflux theory in 1992, I wouldn’t need a cane to walk today. A neck massage pushing the blood down towards the heart is enough to stop an attack for me. I believe the various vein abnormalities can be more subtle than a stenosis in need of angioplasty. Blood circulation can be restricted by a weakened vein (or valve) which narrows intermittently or collapses because of stress and can be kept open without angioplasty by removing the stress (e.g.glutens, aspartame, mercury, mother, cold, flus, toxins, ambition) and enhancing blood circulation (massage, acupuncture, self acupressure, kinesiology, swimming, chiropractic). Individual solutions for the venous blood circulation problem can be as varied as the multiple stress factors which trigger it. See MS Cure Enigmas.net. Last edited by vesta on Wed Sep 12, 2012 6:30 am, edited 1 time in total. I don't think it is intended as an ambush. But I think we are bringing you our answers instead of our questions. drsclafani wrote: Long distance travel is not one of my indications for stenting. The best advise I can give you is to be patient and let your doctors try to figure things out for you.